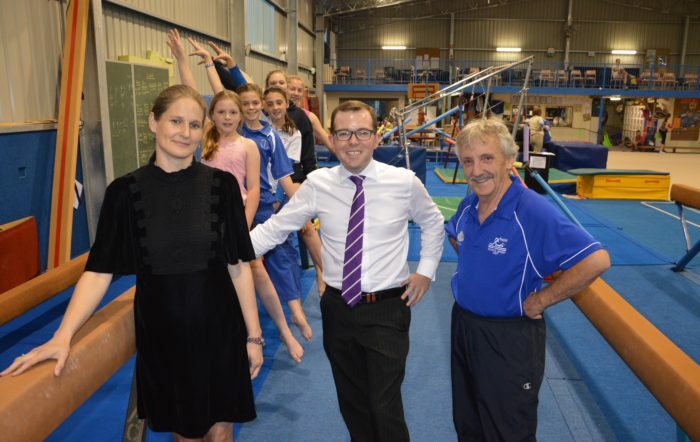 Armidale City Gymnastics Club President Caitlin Rowe-Dawson, left, with Northern Tablelands MP Adam Marshall and the club’s Head Coach Wally O’Hara, with young gymnasts using the current equipment that will be replaced with competition-level beams. GYMNASTS training at the Armidale City Gymnastics Club will get more bounce for their money with a $5,615 grant from the State Government to purchase competitive-level sprung beams for the facility. Delivering news of the NSW Sport & Recreation grant to the club executive recently, Northern Tablelands MP Adam Marshall commented that while the investment by was relatively small, the return would support new generations of gymnasts. “This gymnastics club has more than 400 registered users and most nights of the week the Kentucky Street facility is alive with jumping, dancing, twirling and bouncing youngsters perfecting their gymnastic skills,” Mr Marshall said. “The sport has a very strong following in Armidale thanks largely to the enthusiasm and direction of the head coach Wally O’Hara and his team of volunteers. Armidale City Gymnastics Club President Caitlin Rowe-Dawson said new equipment such as the planned beams were important in giving club members a better chance to improve and progress skills. “The club currently has four gymnasts competing at a fairly high level and the beams we currently use for training are older style and not the same used in higher-level competition,” Ms Rowe-Dawson said.